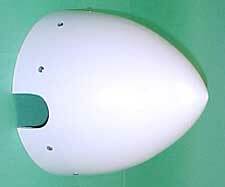 Covers the face of a Warp Drive propeller hub and conceals the propeller mountng bolts. 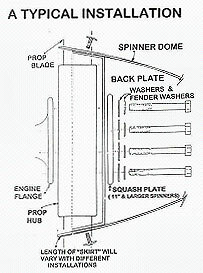 The spinner backing plate can be used as a substitute for the required crush plate for the proper installation of Warp Drive propellers. The 8" spinner hides the hub and only the blade clamping area of the hub protrudes. The openings are cut out square to accommodate the ends of the hub. Our most popular spinner for the IVO Patriot and GSC Systems props. Once again, this one has had the openings cut out to accommodate the Warp Drive hub. 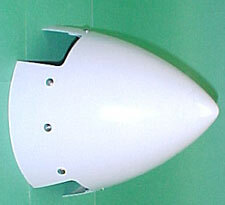 This is also used for many other applications. W 9.125 x L 8.75 x D 1.75 XD up to 4"
The "9P" spinner is a longer version of the 9". It can also be used for all 9" applications where a longer, more pointed spinner is desired. The 9-3/4" (carbon fiber) spinner fits perfectly as a factory replacement on the Eveckton Sportstar aircraft. Fits 3-blade standard, HPL and HP hubs and their bolt patterns through SAE2. The 10" spinner, (shown here un-cut) covers the Warp Drive HP hub. Comes to you with cut outs done, ready to install. W 10.375 x L 10.125 x D 2.125 XD up to 3.5"
The 11" spinner is used for basically the same applications as the 10", it's just a little larger. The one shown here has been cut out for a Warp Drive installation. If you like it a little more pointed, try this 11.5" spinner. This particular one is set up with the back plate in the rear. 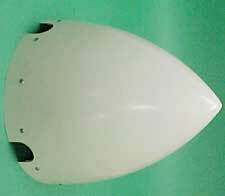 If you have a gap between the prop flange and the front of the cowl, in most cases we can fill the gap by placing the mounting plate on the rear of the prop and extending the back plate (which in this case it really is!) to cover the gap. 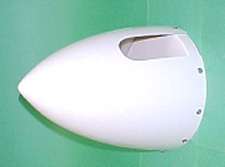 The spinner shown at left was made up for a Sensenich on a Lycoming 0320. The 12" spinner is rounded more than most of the others. 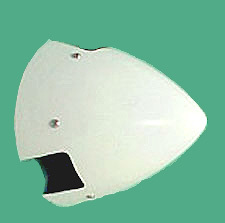 It is used in many applications for Lycoming as it covers up the large ring gear visible in most cases through the front of the cowl. 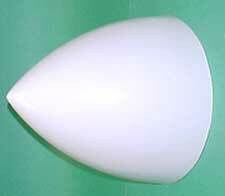 If you like it a little more pointed, try our 11.5" spinner shown above. The 13" spinner, shown here in its un-cut state, is shipped with blade cut-outs for Warp Drive propeller applications, ready to install. 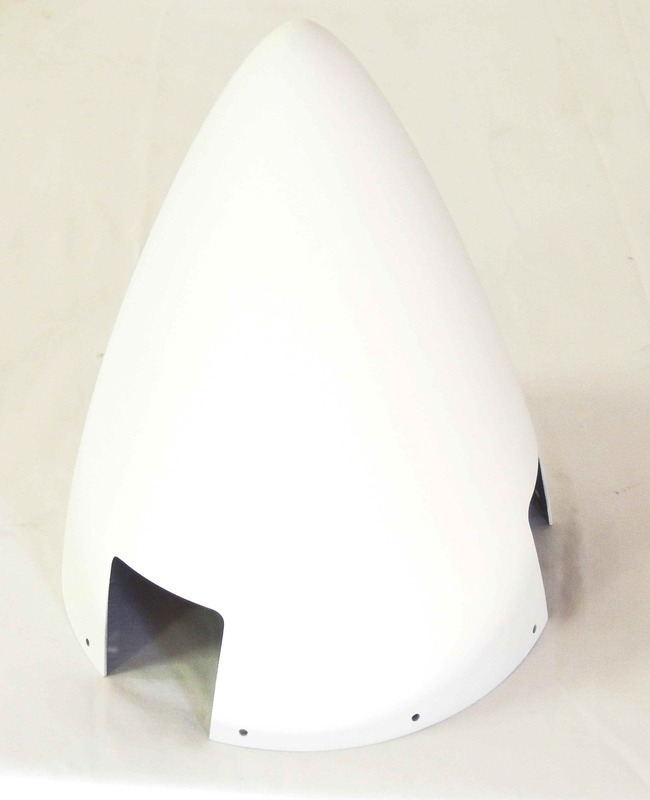 The 14", our largest spinner, was originally designed to cover the Warp Drive four blade hub. The one shown here has been cut for that application. 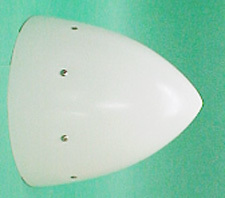 The size of the spinner is the measurement at the rear lip of the dome. 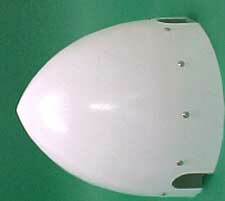 If the spinner is made with the length of the dome left intact, the size is as shown in the descriptions. The "10" spinner is actually 10.375". If it is installed without being shortened, it is 10.375". 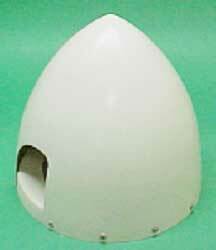 If it is installed with an IVO Patriot, which is only 1.375" thick, the dome is cut shorter and will be 10". All our spinners are sent out balanced to a tolerance of about 1 gram (28grams = 1 ounce). For example, if you remove one of the 8-32 x 3/4" dome mounting bolts from a balanced spinner and put it back on the balancing rig, it shows as being "sharply out of balance". Prices, specifications, and availability are subject to change without notice. Products and materials advertised on this website are sold with the understanding that the buyer assumes all risks and hazards involved in their use or application. Buyer/User acknowledges assumption of all risks, hazards and further indemnifies seller by purchasing and/or using or reselling the products advertised and sold on this website. No express or implied warranties asserted nor fitness of merchantability claimed by Seller.